Obviously, I am in a rut since here I am posting another True Writer review. Trust me, I have never even met Steve Leveen! And let's face it, this is not much of a review because the True Writers all write the same - that's why I keep buying them! 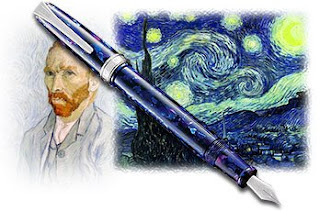 The Starry Night is one of those pens that is just beautiful to look at and I think Levenger did a nice job of capturing the feel of Van Gogh's painting, with one exception: the punctuation of yellow is absent. The stars are not there. The range of blue is striking but it should have had a slight splattering of yellow to really capture the Starry Night motiff. Even so, I am glad I got it. This is my first multi-color resin pen from Levenger and I am pleased with the weight and depth of color. It has more presence than the demonstrators and solid color pens but not as heavy as the Medalist. Thanks for the compliments and enjoy your pen! Well, I think you're in a happy rut! Have you discovered Levenger's Outlet on eBay? There are some great deals on True Writers there. I recently found a Kyoto True Writer for $31 and a True Blue TW for $21!